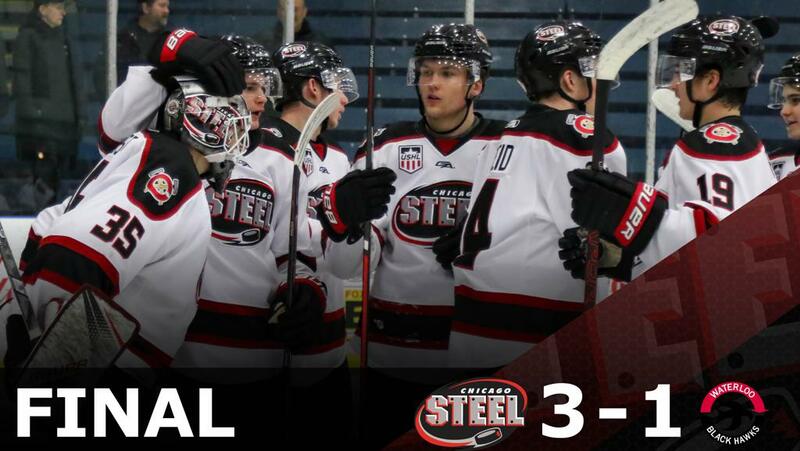 WATERLOO, IOWA — Reilly Herbst stopped 36 of 37 shots he faced and the Chicago Steel scored a pair of goals in a 24-second span late in the second period to open the scoring and added a third early in the final frame en route to a 3-1 victory over the Waterloo Black Hawks Friday night at Young Arena. Chicago (35-20-4-0, 74 pts.) captured the back half of a home-and-home with Waterloo (36-16-6-2, 79 pts.) as each team jockeyed for playoff positioning in its respective conference. The game was scoreless for the first 36:36 of play as each team killed off three penalties thanks to strong defensive efforts and goaltending on both ends of the ice. Steel center Josiah Slavin broke the scoreless tie 16:36 into the second period, slicing through the defense and slipping the puck through the five hole of Waterloo goaltender Jared Moe. Right wing Mathieu De St. Phalle sprung Slavin into the zone with a blind pass over the blue line, allowing Slavin to carry into the zone where he went inside out on a Waterloo defenseman before beating Moe. On the following possession, Chicago goaltender Reilly Herbst slammed the door on a two-on-one opportunity as Waterloo looked to erase the deficit. Left wing Gunnarwolfe Fontaine collected a loose puck in the neutral zone moments later and used his speed to get around a Waterloo defenseman before he beat Moe through the five hole for the second time in 24 seconds. The goal was the rookie’s 20th tally of the season. Defenseman Owen Power collected his 10th goal of the season with a powerplay strike early in the third period. The scoring play started in the defensive zone with Herbst, but it was De St. Phalle who set up Power for a wrist shot past the blocker of Moe. Waterloo answered back less than four minutes later to make it 3-1 with 11:53 to play in the game. Forward Ryan Drkulec picked up his 12th goal of the season as he jammed home a wrap-around pass from forward Xander Lamppa. It was the only blemish on Herbst’s otherwise perfect night. The Steel extended their lead to three points over third place Cedar Rapids and Youngstown as the teams battle for second place and a coveted First Round bye in the Clark Cup Playoffs. Chicago heads to Dubuque tomorrow night for a matchup at 7:05 p.m. at Mystique Community Ice Arena against the Fighting Saints. The Steel return to Fox Valley for the final regular season home game on Friday, April 12 against the Central Illinois Flying Aces as the team hosts Fan Appreciation Night, giving away hundreds of prizes to fans on the special evening.